With a Fresh farm market, pick your own produce, farm animal center/play area for kids, and special events hosting and birthday parties, located just north of Edmonton, Alberta, Prairie Gardens & Adventure Farm is the perfect place to visit on a day trip for a family outing. You might not know that Prairie Gardens & Adventure Farm is a Family Farm near Bon Accord. It’s like visiting Grandma’s in the fifties! You and your family can enjoy the true farm experience. Prairie Gardens & Adventure Farms is proud to offer our exceptionally fresh produce to you from our Farm Market at the farm. You are invited to come browse through our wide array of “super fresh” fruits and vegetables. There is always someone on hand to answer your produce questions or offer you a taste of our ever-changing specials. At Harvest time we offer many sizes of pumpkins for you to choose from in our indoor pumpkin patches, as well as corn stalks, gourds, squash and many other items to help you decorate for the fall. Come pick your own fruits and vegetables on our fully operational working farm. It’s a great day outdoors for the entire family! 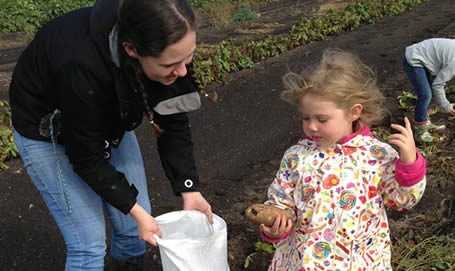 Share in our garden harvest with a membership in our Community Supported Agriculture Program! Support local & share in our farm life. Enjoy the convenience of shopping at our Farm Market for field-fresh produce, jam, local honey, ice cream & ice-cold beverages.